A self-described “professional Type-A planner,” Courtney feels she spent “too many hours” crafting the “perfect” birth plan… only to toss it out the window during labor and delivery. At 38 weeks, after learning Jackson was breech, and that she was Group B positive and only dilated .5CM, Courtney scheduled an induction for 40W6D; but, she went into labor 1.5 days before induction day. At the hospital, Courtney learned that meconium in her fluid would require a NICU team at birth; and, while Jackson had turned, he was still in the occiput posterior position. Eventually, after several hours on Pitocin, Courtney’s amniotic sac had resealed (which required an amnio-hook) and her contractions were ineffective, causing her cervix to swell and making the situation potentially dangerous for mama and baby. After taking what she describes as “hit after hit,” her birth story ends via C-section, including a failed epidural and hemorrhage. She and Wes welcomed baby Jackson at 8:38PM… 8 minutes after her previously scheduled induction time. During postpartum, Courtney struggled with breastfeeding Jackson, and made the very difficult decision to stop after a few weeks. She also experienced intense postpartum anxiety for which she eventually (around 6 months pp) sought professional help through her Primary Care Provider and licensed therapist. During this time, Courtney relied on the tremendous amount of support she received from her husband, family, friends, and even her client, Sarah, who candidly shared her own new motherhood stories and encouraged Courtney to make the best decisions for her and her family. Today, about a month shy of Jackson’s first birthday, Courtney has established her “new normal” and couldn’t imagine life without the stubborn, giggly, busy little boy she made. Professionally, Courtney is one of the voices behind Sarah Wells Bags as Sarah’s primary marketing consultant. She loves supporting other new mamas in their breastfeeding and pumping journeys, wherever (and for however long) it may take them, and can’t get enough new baby pics. Feel free to reach out to her anytime at courtney@sarahwellsbags.com. 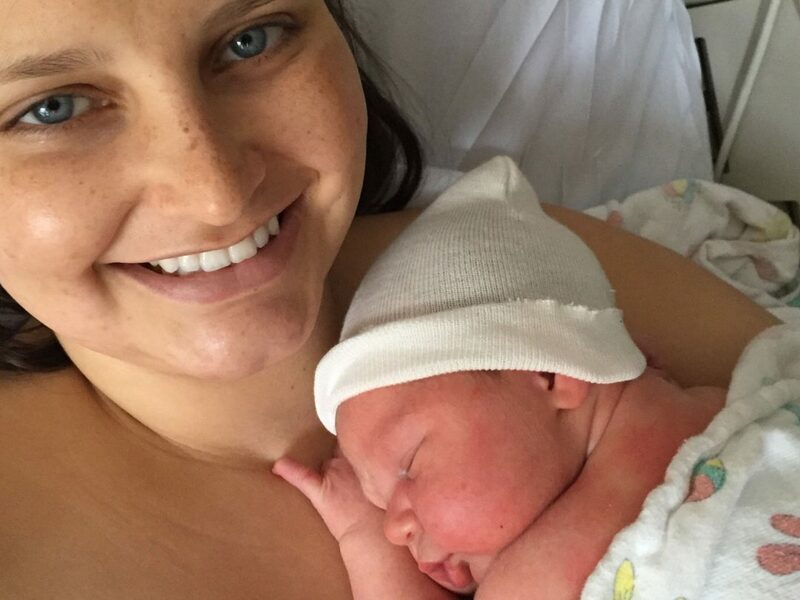 Courtney and husband, Wes, welcomed their first (and likely only!) child, Jackson, in August 2016. Courtney experienced a miscarriage in October 2014, had a somewhat difficult pregnancy, and ultimately delivered Jackson via C-section. Given her experience working with Sarah Wells Breast Pump Bags and the several newborn and breastfeeding classes she attended, Courtney was confident her fourth trimester would be a breeze … until she began experiencing difficulty breastfeeding and postpartum anxiety. Now, her advice to new moms is: “Set yourself up for success even if you have to ‘fail’ first.” For example, she recommends knowing what your breastfeeding resources are and who to talk to if you’re experiencing any type of postpartum depression or anxiety. Courtney and family now live in Austin, Texas, where they survive off of breakfast tacos and “weird” vibes. Courtney works with Sarah Wells Bags and is one of the several voices behind @sarahwellsbags on social media and their blog. This episode is sponsored by Sarah Wells Bags. With thoughtful functionality and chic styling, Sarah Wells offers breast pump bags and accessories to help you reach your breastfeeding goals. An all-in-one bag for your breast pump, pumping accessories, laptop, phone and more, Sarah Wells Bags also transition to a diaper bag or purse when you’re done pumping. See the full collection, including the Pumparoo—a wet/dry bag and staging mat for pump parts at sarahwellsbags.com. Use promo code: BIRTHHOUR15, good for 15% off all orders at sarahwellsbags.com. Be sure to check out their World Breastfeeding Week Giveaway and FB Live over on their FB page.